By nature, parrots are inquisitive, intelligent, and social animals who love attention, communication, and socialization. You can capitalize on these characteristics and obedience train your bird, teaching him/her behaviors that will make your lives more enjoyable, such as stepping on your hand or wrist on command, and going to a designated perch. 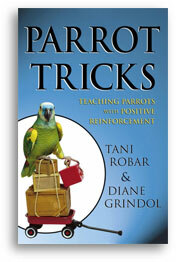 Then you can progress to teach your parrot all kinds of tricks. From the essential basics of obedience training to awesome tricks that will amuse and amaze your friends, this book covers techniques to use during the "get acquainted" period; setting up a training area and using food as a training tool; training basics such as targeting, luring, and using cues; necessary obedience skills such as step up, come, perch, and stay; the basic retrieve command, the foundation of many tricks; simple tricks such as shake hands, high five, kiss, and take a bow; tricks based on the retrieve command, including basketball, ring on the peg, and stacking cups; advanced tricks such as pulling a wagon, pushing a grocery cart, raising a flag, and riding a skateboard; innovative tricks that showcase your bird's natural abilities; chaining tricks, such as recycling and going to the mailbox; verbalizations and talking using the Rival/Model Method or the Positive Reward Method; and directions for making simple props. With this book, patience, and practice, you'll build your understanding of and relationship with your bird as you build a repertoire of tricks. You can get your parrot to jump through hoops for you — literally!